The story began early this year as a number of the team met up at our house on Friday 27 January. This year Janet, the wife of my best man, Tony, is joining the team whilst Tony himself is in Uganda with another charity. Janet has a degree in nursing and then went on to become a midwife. She has not been active in this field for a few years but Liz is sure that Janet's experience and skills will be invaluable to the team. She grew up in Uganda herself (Janet, not Liz!) and so she speaks a smattering of Kiswahili. The evening was a chance for Janet to meet Su and Tracey and other members of the team, Prue, Dipesh and Pedja. Liz was able to offload the boxes of toothpaste and toothbrushes that she had been asked to take out so that others could incorporate these into their baggage allowance. She tried to send me a photo of the team at the airport but this did not come through, hence the library picture of Terminal 5. She phoned me from the plane, as I was walking down Knebworth High Street. They are on BA 047 to Dar es Salaam, which took subsequently off on time at 19.04. It is due to land in the steamy heat of Dar at 07.17 (local time) tomorrow. They then have a few hours to recover from the night flight before catching the Precision Air flight up to Mwanza. As in previous years, the readership of this blog is international. I got a message yesterday from somebody from our church who is on business in Vienna. "Gruß Gott", David ! Strange, thought I, as I had thought they were flying straight from Dar to Mwanza. Then I recalled that my wife is technologically challenged and I read the two texts as one. She told me later that she had, indeed, hit SEND by mistake. All then made sense and reminded me of a French short story, Zadig, in which the main character is arrested because the two halves of an innocuous letter he has written, when torn in half, each appear to be an attack on the king. Liz got in touch later in the afternoon. 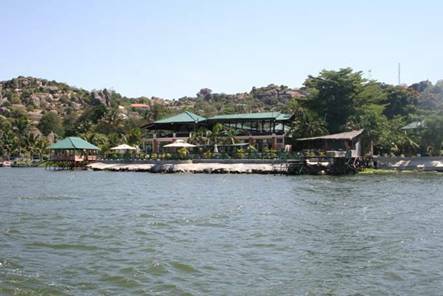 All of the team had just met up at the Tilapia Hotel (see photo) on the shores of Lake Victoria. It is, apparently, VERY hot and there were loads of kites, herons and pied kingfishers flying around. They were all very tired as it took them ages to get through immigration at Dar as they have introduced biometrics and other tests. They then had to fly up to Mwanza. She had met up with all of the team of dentists and nurses and tomorrow will meet with the clinical officers, whom they are there to train. They had tried to sleep but then there had been a power-cut in the Vizano Hotel, where they are staying (see previous blogs for descriptions of the Vizano !). This morning they had their orientation meeting, especially important for those who have not been before. Last year Ian and Andie Wilson, who had founded the charity, returned to the UK. 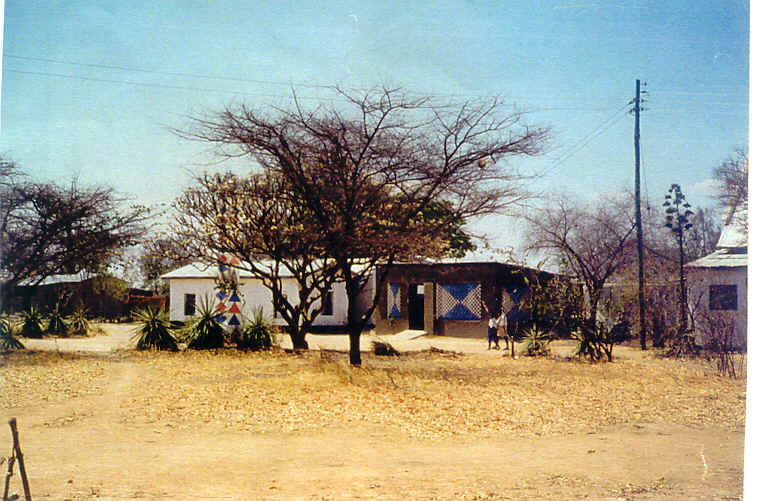 Their role at the Hope Dental Clinic (the permanent private clinic in Mwanza that helps to fund the charity) has been taken over by Paul and Beth Brind, whom the team met. They revealed that, for Christmas lunch, they had had roast hippo ! Liz also learnt that this is the 25th group to fly out to Tanzania under Bridge2Aid’s Dental Volunteer Programme and they have trained over 180 clinical officers in basic dentistry. If anyone is in doubt that this work is needed she learnt that there are currently 116 dentists in the whole of the country, which has a population of 45 million! Bukumbi, the village supported by B2A, which provides safe accommodation for lepers and albinos, is being taken over by the Government, which is good news. The people there have also been given a source of income, making school shirts and skirts. It rained all night, which relieved the humidity somewhat. After the orientation, they set off to Shinyanga (about 3 degrees South of the Equator), where Liz called me from the Karena Hotel, which is better than the Vizano in Mwanza. En route, they stopped off at the International School (see http://savannahplains.com ) to pick up their packed lunches, as the school have volunteered to do this for them every day, as well as making their pool available at the weekend. Apparently the school is very exclusive and attended by the president’s son. It is even building its own mini safari park ! 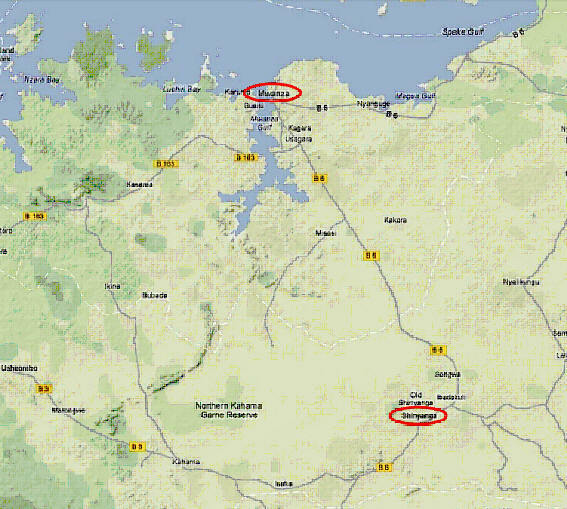 Today they drove to Bugisi, just near the fork in the road South-West of Shinyanga (see map above). En route they got stuck on a disused railway line and had to rock the minibus off. The clinic is run by a nun called Kate, who has been there a number of years. The place is a bit more up-market from what they have experienced in previous years; there is even running water and electricity (some of the time!) which means they have a fan above them. Liz said that it is extremely hot and so this has been welcome, as has the working toilet they have been using. There is even a café on the site ! Kate, who is also a trained nurse and midwife, has cleared out two of the rooms of the maternity clinic and they are running their clinic there. In the clinic there is a baby who was born at 26 weeks with a birth-weight of just over 1kg - about the weight of a bag of sugar. They met up with the 5 clinic officers, including Moses, who is based in Bugisi. the others come from clinics in other villages. Liz is training a doctor with the interesting forename of Revocatus ('he who has been called (again)') who comes from about 30km away. There is one lady in the group. Kate is keen that the locals take advantage of their presence - they saw 64 patients today. Tomorrow there is an AIDS clinic and they already have 50 patients 'booked in', although they may have to employ some triage and leave those with fewer problems for Moses to treat after they have left. They also met the District Dental Officer, Dr Saambili who seemed to be very switched on. By mid-afternoon all of them were flagging in the heat and there is a lot for the trainees to learn. Janet's Swahili is coming in useful and, as always with a language, it has been re-surfacing from the forgotten corners of her brain. She actually sent me a text herself, just before I left the office, to tell me what a great time she was having. When I got home I found an email from Tony, letting me know what he has been up to in Uganda. He had managed to get internet access ands so was able to read this blog and find out more about what his own wife has been up to. Oh well, I guess that someone has to stay back at the ranch in Blighty to help out with Royal Bank of Scotland ! 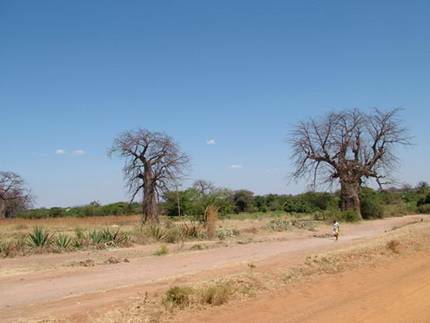 I already had the photo on the right lined up for today's blog, even before Liz that there were loads of giant baobab trees around. This is actually a photo of the road to Bugisi. She had seen a bright blue sunbird and a sacred ibis today. There are obviously lots of banana plantations around as there are piles of them for sale at the side of the road. They have decided to eat at the hotel every night, although, as always with Tanzania, they have to say they want a buffet about 90 minutes before they actually want to eat as the service is glacial. As we spoke the call to prayer was going on in the background (in Shinyanga - it would be a bit strange in Bishopsgate!). I only allow myself one photo for each blog entry and so today I thought I would use an image of a sacred ibis, which Liz saw yesterday. She reported today that there are loads of herons and egrets in the fields on the way to Bugisi. They saw 75 patients today and Liz said that it was quite a challenge. Kate, the nun in charge, was keen that the AIDS patients should be treated equally but Liz said that many of them were really just too weak to be treated. The clinic is sponsored by the Tanzania Interfaith Partnership and the team met a Polish nurse, Monika, who been there a year, and an Irish teacher from the local school. They had seen a lady lying on her side on a bed in the maternity ward and thought she was just a visditor having a rest. Half an hour later she gave birth to a little boy, her first. No fuss or noise. They suggested that he be called Brian after one of the dentists on their team, who revealed today that, at weekends, he puts on a clown outfit and performs at children's parties as Uncle Brian. He made an animal out of balloons for one of the children in the clinic, who seemed a bit scared ! The local language in that area is not actually Swahili but Sukuma. The trainee with whom Liz has been paired has very poor English and she is finding it hard going, trying to get him to grasp some of what he needs to learn. The clinic is very clean and tidy and very well run, although the electricity failed again today at lunch time. Liz is not sure if it is provided by a generator or just dodgy mains. It was slightly cooler today and rained as they drove back to Shinyanga. Sorry today's entry is a bit late; I only left the office at 19.00. Today was their last day at Bugisi. I managed to find a picture of the place on the web; I think this may be the school. somewhat bizarrely, the update for today's blog entry was taken whilst I was waiting for my appointment at the optician. It was an eventful day in Africa, to say the least! Each day, on the way to Bugisi, they pass the other clinic at Tinde. As they did so today the lady clinical officer ran to catch the bus, tripped up in the pouring rain and knocked herself out. She had to be carried on a stretcher, still unconscious, into the clinic. They were also without the district Dental Officer as his father was taken to hospital in Mwanza. During the day there were two more births in the maternity ward. One woman walked to the clinic and gave birth half an hour latter. Sister Kate gave them a tour of the clinic and they were able to see the contrast. There was one 6-year old boy, who had malaria and it was doubtful if he would make it. Don't forget a mosquito net would cost you just £5. Liz said that they all think that the Malarone tablets they are taking are keeping them awake at night but this seems worth it when the alternative is malaria, which is very prevalent in Tanzania. There was also a 45 year-old woman, surrounded by her family, who was dying of AIDS. Sister Kate also makes regular visits to a leprosy village. Liz gave out lots of old T-shirts, which were a great hit. The multi-talented Brian revealed that he has other skills. he collects millipedes and has helped out at a zoo in the UK, whree his daughter works, doing a root canal treatment on a tiger. just imagine a 9.3 cm molar root! They were going out to a local restaurant this evening - adventurous ! 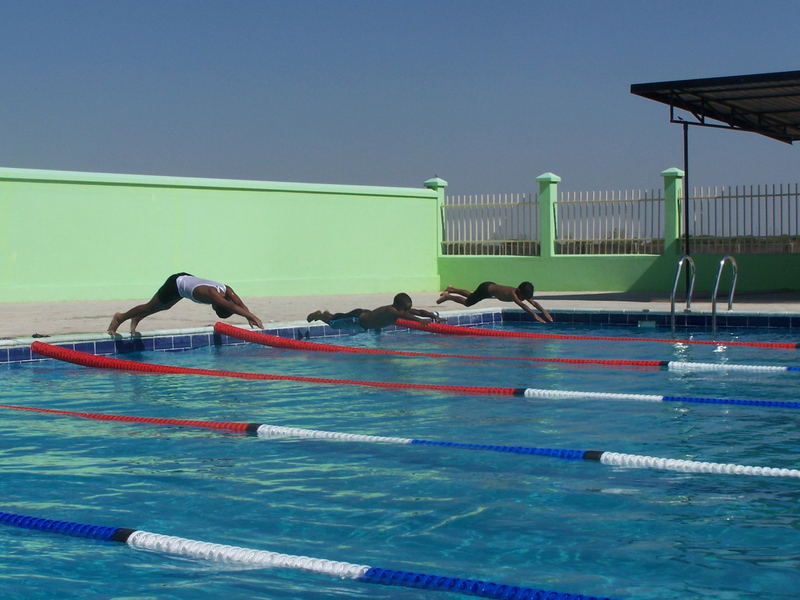 Tomorrow is a rest day and they are going to the international school to use their pool. Pictured left is the pool at the Savannah Plains International School, where they have been spending the day relaxing. Running a blog like this, you are in a strange position in that you never really know if anyone is reading it. Every now and then I do get an email (which I always welcome) and yesterday I heard from a friend who suggested that, when I described the service at the restaurant in Shinyanga as 'glacial', perhaps this was not the most appropriate word for Africa. Liz rang when she got back from a barbecue that had been put on for them by the International School. The school was founded 3 years ago by a rich diamond mine owner who is also something to do with the government. It is half-term and so there were only 25 children there. The facilities are excellent and most of the children are from Dar. They had to abort the barbecue, at one point, as a huge storm blew up. Apparently one of the rivers in the area is flooded, which is why the numbers at the clinic are down. The others had walked into town to visit the market but Liz had not bothered as it is extremely muddy (no asphalt roads). Apparently the other team, who ae based at the Geita gold mine, had to wait for three ferry cycles before they could get across the inlet, only to find, when the got to the mine, that there is not enough accommodation at the moment and so they are doubling up on the rooms. I told her about the fact that mighty Stevenage Borough had held Spurs a goalless draw, only to find that she had watched the whole match at the school. She said it was strange seeing adverts for ABC Taxis, whilst watching TV in Shinyanga ! Tomorrow they are going to pay a courtesy visit to the Regional Medical Officer before setting up shop at the next clinic in Tinde. A reality check today, probably because they were spoilt last week. The clinic at Tinde, whilst well run and clean, has no running water and no electricity. They are back to the usual hole in the ground for a loo. The sterilisation room is inside, whilst the treatment is performed out in the open on a balcony, under a corrugated iron roof. The lady trainee (who knocked herself unconscious) is back but the District dental Officer has had to go with his father to Dar as his father’s health had deteriorated. They saw patients today, fewer than expected as the prime minister is in the area and the locals have been ‘asked’ to turn out and wave. Liz has been training Lucas, who is based in Shinyanga. Today they treated a 22-year old man, who had lumps under his jaw, which they suspected was TB. They thought this suspicious and sop tested him and confirmed that he is HIV-positive. The clinic seems to have a number of tethered donkeys with a foal who wandered up to them, whilst they were eating their packed lunches. Liz has seen lots of kingfishers on telegraph wires (kingfishers are not always associated with water) as well as cordon bleu finches (no, they are not edible!). They have also seen some very pretty black and white butterflies with purple spots. 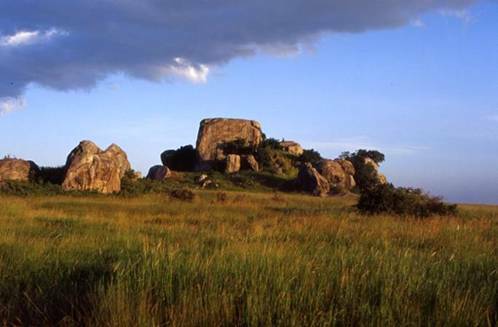 En route to Tinde, which is about 22 miles, they pass lots of granite outcrops, called kopjes (see on right). It is this word that forms the derivation of the kop at Anfield Football ground. lots of emails from readers out there in the bloggisphere - thank you ! 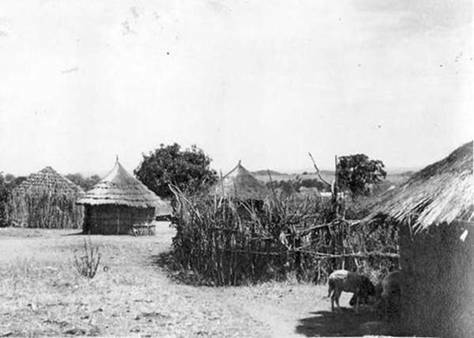 I managed to find this picture (left) of Tinde in 1936. I wonder how much it has changed ! When I 'phoned Liz yesterday she got a message, towards the end of the call, to say that she had a minute left, as she only has a Pay-As-You-Go SIM. By the time I got home I had forgotten this and so she had no credit today to receive my call. No problem – I just phoned Janet’s phone instead. It has been really hot today, especially under the corrugated iron roof; so hot, in fact, that 4 patients fainted. The team was also one important member down as John Simba, their ‘fixer’, who went down with malaria today. John is permanent member of B2A staff, based in Mwanza. The local take all of the normal precautions against malaria but do not take anti-malarial drugs because of a) the cost and b) the long-term impact. The team drove him part-way back to Mwanza and met B2A staff who had come out to fetch him. They immediately put him on a drip. He had been training another guy, Haji, who has stayed with the team. The 'fixer, by the way, is the person who helps set up the clinic and liaises with the local staff. Without him they would have nobody who speaks the local language. Those of you familiar with The Lion King will recognise the name ‘Simba’. It is actually Swahili for ‘lion’. Liz has been training Joseph today, who is based in Tinde himself. There have not been many patients but .. enough. This evening they have been advised that the Prime Minister, Mizengo Kayanza Peter Pinda (known as 'Peter') would like to meet them at their hotel, as he has heard about the work they are doing.They may ask him why it is that visiting charity workers have to pay for both a work visa and a tourist visa ! Today they have seen lots of goats and truckloads of the local Sanga (long-horned) cattle. I was able to give regards from Ireland (see yesterday). Well, for whatever reason, the meeting with the Prime Minister, Peter Pinda ( I wonder if he ever picked a peck of pickled peppers !) did not take place. John Simba, who is now back in Mwanza, had set this up and this is probably why it did not happen. During the night there was (yet another) huge storm. If you have never been to the zone between the two tropics then just think of the worst rain that you have experienced and then double or even treble that. The water came in under the door from the balcony and soaked Liz’s scrubs. They had all decided, anyway, to give their scrubs and shoes to Sister Kate for use in the Bugisi clinic. Later this evening she texted me to say that yet another storm was in progress ! Liz had Moshi today, the lady trainee. The trainees then sat their written exam and received their certificate of attendance. One of the problems has been that, because the District Dental Officer, who speaks their language, has not been around, they have not been able to convey to the trainees exactly where they need to improve. They also had their usual ‘end of term’ party with cake and juice. They are staying at Shinyanga until tomorrow, as it is only two hours away from Mwanza; they will set off ‘back to base’ at 08.00 tomorrow. The big news today was that Brian had found a millipede, which he is feeding on banana leaves. 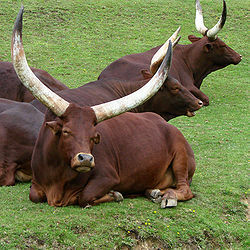 Today’s picture is of the Sanga cattle that I mentioned yesterday; I had lined up one of the Prime Minister but decided that this was no longer relevant. Apologies for some of the random spelling over the past two days, which I have corrected retroactively. Unfortunately FrontPage, which I use for publishing this site, does not have a built-in spell-checker and my typing is hopeless. Today the team is back in Mwanza, Tanzania's second largest town, on the shores of Lake Victoria. As you can see, this is a large town with some 1.2 million inhabitants. They took 3 hours to get back and were reunited with the other team and shared lots of stories. Between them they treated 870 patients and, of course, trained 11 clinical officers, each with a patch of about 15,000 villagers. It has also been calculated that, between them, the nurses sterilised over 4,000 instruments (yes, pedants, I am aware that this is not, technically true, as each instrument was sterilised multiple times!). This means that another 165,000 Tanzanians will now have access to basic dental care, who previously just had to suffer (ironically, I got an email from our son today, advising us that he has a hole in one of his teeth!). They then went off to the Tunza Lodge Hotel for a de-brief, followed by a barbecue and a chance to buy some Traidcraft wares. She has now said her Goodbyes to many of the team, including Janet, who are setting off for the Serengeti tomorrow for a short safari, or who are off for a bit of a beach break on Zanzibar. The flight back for Liz is not until the afternoon. I warned her that, when she gets back, she is in for a shock. When she left, the garden and fields behind our house were still covered in snow; today there were people fanning themselves in the heat on the London Underground. I have been asked today for a photo of Brian's millipede. Sorry but i am not sure what species it is. Now, I have to admit that I have no idea what type of millipede Brian has found out in Tanzania, but on the right is picture of a Tanzanian giant black millipede. Today they take off from Mwanza at 14.00, landing at Kilimanjaro airport at 15.20. They then have a short stopover, before flying from Kilimanjaro to Nairobi in Kenya, landing at 16.50. The night flight to London is not scheduled to take off until 23.30, landing at Heathrow at 05.20 and so they pay a fee to use the BA lounge. Think of me tomorrow morning, as I will have to get up at 04.00 in order to drive around the M25. Flight to Nairobi arrived at 17.15. I have just caught up with Liz in the First Class Lounge. Very hot in Nairobi and looking foward to being home. They have already been in touch with the others, in the Serengeti, who have seen lots of animals and were supping sundowners on the verandah. The flight took off slightly late at 23.35 and is due to land at Heathrow at 05.39 tomorrow morning. Flight landed at 05.18 and they are now back home, feeling a little culture-shocked.